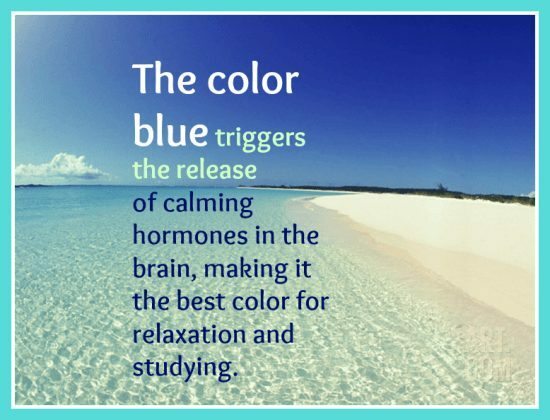 The color blue triggers the release of calming hormones in the brain, making it the best color for relaxation and studying. Photo via Art.com. Blue is the favorite color of many people. But did you know that blue is the color most preferred by men? Maybe this has something to do with the “blue power suit”. Wearing the color blue evokes authority, trust and a sense of calm. Blue is also found in meeting and conference rooms to keep people calm and focused. Blue is often used to decorate offices because research has shown that people are more productive in blue rooms. Although famously calming and peaceful, blue can have different effects on a room depending on its temperature. Shades known as cool blues, like cobalt, turquoise, and ice blue, have yellow in them and tend to recede, or back away, which can help a small space look bigger. Color experts explain that cool blues encourage calmness. Sometimes cool blues can go a little further and be cold. But in a bathroom, where you want a crisp, clean vibe, that can be a good thing. Warm blues, like denim, ocean blue, or slate blue, contain hints of red. Color experts say they advance, or come toward you, so they help make a room feel cozier. Decorators often like warm blues in social spaces, like the living room, the kitchen, or the dining room. “There’s something in the color blue that triggers a relaxation response. It makes me feel as if I’m floating in a boat, looking up at the sky. Everything about it speaks of a gentle, tranquil, Zen state of mind. This is not an aloof blue. 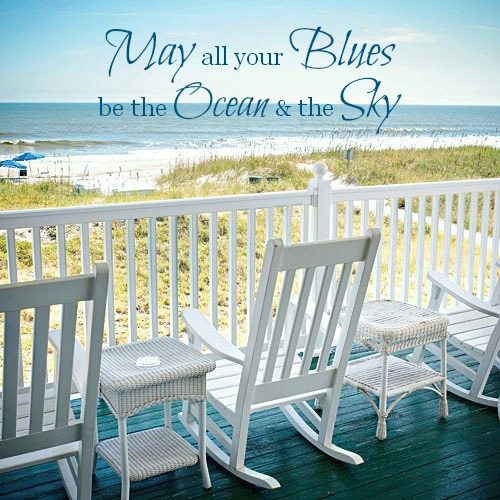 It’s a blue that gathers you in.” Color expert Leatrice Eiseman. Featured on Blue Painted Porch Floors.